Why would there need to be some consideration to list the Iranian Revolutionary Guard Corps as a terror organization? Anyone? US State Department-designated terrorist group Hezbollah announced that Facebook and Twitter had terminated its main accounts. In a post on encrypted messenger, Telegram, Hezbollah opined that the shutdowns were “part of the propaganda campaign against the resistance due to the important role of the organization’s information apparatus in various arenas.” Hezbollah then began redirecting people to other Hezbollah accounts on social media. More here. *** The U.S. Navy stands ready to ensure freedom of navigation and free flow of commerce, a spokesman for the U.S. military’s Central Command said on Thursday, after Iran warned it will block oil shipments through the Strait of Hormuz. 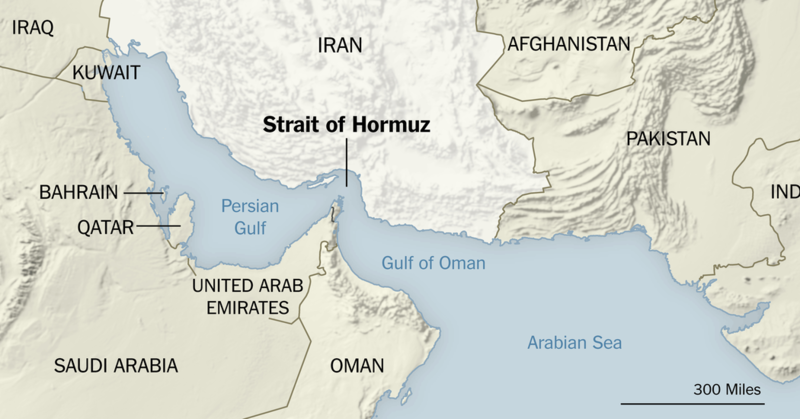 Iran has threatened in recent days to close the strait, a vital route for world oil supplies, if Washington tries to cut Tehran’s exports. An Iranian Revolutionary Guards commander said on Wednesday Iran would block any exports of crude for the Gulf in retaliation for hostile U.S. action. The Islamic Revolutionary Guards Navy (IRGCN) lacks a strong navy and instead focuses on an asymmetric warfare capability in the Gulf. It possesses many speed boats and portable anti-ship missile launchers and can lay naval mines. Full story. Senior current and former officials familiar with the matter tell CNN the White House is considering designating Iran’s powerful Islamic Revolutionary Guard Corps as a foreign terrorist organization, a debate that has senior Cabinet officials squaring off on both sides. The designation decision, formally under the State Department’s purview, is taking on heightened importance as part of the White House’s increasingly aggressive strategy towards Iran. Officials have been debating it for several months and have yet to reach a consensus. While some warn a designation could pose risks to US personnel and installations overseas, it would allow the White House to freeze IRGC assets, impose travel bans and levy criminal penalties on top of pre-existing economic sanctions imposed by President Donald Trump. “The United States is trying to change malign behavior of the Iranians and deter their aggression,” said Chris Costa, the executive director of the Spy Museum and a recently retired special adviser to Trump on counterterrorism. For that goal, “the special designation is a very important tool,” he said. Secretary of State Mike Pompeo is in favor of the designation, sources familiar with his thinking say. “There’s lots of things that are being discussed, things that will prove, we believe, very effective at the end goal-which is, at the end of the day, what matters, right?” Pompeo told CNN in a recent interview. “The end goal is to convince the Islamic Republic of Iran to be a normal country.” He declined to discuss specific plans for future sanctions and designations. But labeling an official state military as a terror group, particularly a group with the reach and force of the IRGC, would be unprecedented and could expose US diplomatic and military officials to additional hazards, some warn. The powerful military and security body is key to Iran’s influence in the Middle East, often linked to Iran’s support for terrorism. The organization controls wide swaths of the Iranian economy, including the energy sector. Director of National Intelligence Dan Coats has cautioned the administration that designating the IRGC could pose dangers to US forces, according to one source familiar with the matter. While the intelligence community doesn’t make policy decisions, its head, Coats, is the lowest common denominator who pools the analysis and assessments of all the agencies to advise policymakers. Former Secretary of State Rex Tillerson spoke publicly about the potential dangers of designating the IRGC. “There are particular risks and complexities to designating an entire army, so to speak, of a country where that then puts in place certain requirements … that then triggers certain actions that we think are not appropriate and not necessarily in the best interests of our military,” Tillerson told reporters during a press briefing in October. In March, Trump ousted Tillerson, who had advocated for staying within the Iran deal, replacing him with Pompeo, then his Central Intelligence Agency director. In contrast to Tillerson, Pompeo has been a hardline voice on Tehran. According to sources familiar with the matter, the top US diplomat wants as many designations against Iran as possible to squeeze its economy. He has not been shy in speeches or social media posts about stopping Iranian Supreme Leader Ali Khamenei from wreaking havoc in the Gulf. Alireza Miryousefi, a spokesman for the Iranian mission to the United Nations, said talk of the possible terrorist designation was in keeping with an American tendency to use terrorism for political aims. The US will have to consider its allies in Europe if it takes the step of designating the IRGC. Since Trump announced his intention to abandon the Obama-era Iran nuclear deal in May, his administration has imposed a swath of new sanctions, including one that will require all countries to eliminate Iranian oil imports by November. That move is particularly unpopular with European allies struggling to hold the deal together and keep a lid on Iranian nuclear development. Trump administration officials leave next week for a second round of international trips to get partners on board with its broader strategy of increased sanctions and strictures on Iran. The National Security Council did not comment on that effort. Europeans say they remain unconvinced. “The Americans haven’t explained how they want to reach their goals” with regards to Iran, said one European official. National security adviser John Bolton, meeting last month with European officials to talk about the US campaign against Iran, told them there would no exemptions from sanctions for European companies or entities that do business with Iran under UN sanctions, European officials said. Brian Hook, the State Department’s director of policy planning, stressed that point in a Monday briefing, telling reporters that the US is “not looking” to issue waivers to European companies. Bolton told Europeans that Washington was looking for Iran’s “unconditional surrender,” harkening back to demands on Iran made by Pompeo during a speech in late May. The top US diplomat said at the time that the US wanted Iran to abandon its nuclear program, pull out of the Syrian war, and cut ties to terrorism. Several other administration officials have suggested taking other steps to ramp up pressure on Iran before taking the dramatic step of designating the IRGC. Successive administrations engaged in a similar debate on whether to designate the Taliban as a foreign terrorist organization, ultimately deciding such a move would hamper efforts to negotiate a political solution in Afghanistan. Iranian forces might retaliate and “ramp up anti American activities in Iraq,” the official said. Iran could also call American special forces terrorists or threaten embassies, potentially endangering the long-term US presence in Iraq and Syria. The IRGC, in particular a special unit called the Quds Force, which is the equivalent of US Joint Special Operations Command, has also attempted to recruit “operatives around the world to undertake activity on behalf of Iran,” the official continued. While the Quds Force has done humanitarian work and conducted military operations over the years, “its current focus remains proxy activities in the region” in Yemen, Iraq, Syria and Lebanon, for example, the official said. Officials also suggested a designation of the IRGC as a foreign terrorist organization, while dramatic, would be largely symbolic because it is already considered a terrorist entity under a 9/11-era executive order signed by President George W. Bush to block terrorist financing. In October, Trump authorized sanctions aimed at the IRGC under that order, calling the Revolutionary Guard “the Iranian Supreme Leader’s corrupt personal terror force and militia.” He urged US allies to follow suit and impose sanctions against Iran to target its support for terrorism. With a special foreign terrorist designation, the administration could levy a wider and more severe set of sanctions. Former top CIA lawyer John Rizzo told CNN that a special designation would likely not change how the CIA targets the IRGC. Many former military and intelligence officials told CNN that US troops are already in significant amounts of danger in the regions where our forces collide with Iran’s military or its proxy forces. Calling them out as terrorists wouldn’t make a big difference, they argue. “It’s a specious argument to suggest the US military is more vulnerable” if the US makes this call, said Costa. Anthony Shaffer, a retired US Army Reserve lieutenant colonel who directed several major intelligence operations in the Middle East, told CNN,” My recommendation has always been that they should be a terrorist group,” Shaffer’s book “Dark Heart” describes his experience directly encountering the IRGC funding terrorist efforts in Eastern Afghanistan. “I don’t see how there’s any downside,” he continued. But if the US takes this unique step, labeling the military branch a terrorist group, it runs the risk of making the IRGC a “hero in the eyes of probably most Iranians for ‘resistance’,” said James Durso, a former US Navy officer and staff member on the Commission on Wartime Contracting in Iraq and Afghanistan.